BEST INITIAL QUALITY AWARDS. 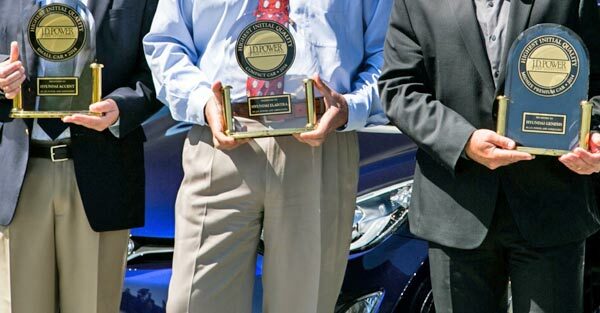 This award is given to vehicles whose owners reported fewer claims in the first 90-days of purchase. CALIFORNIA — J.D. Power, the global market research company who captures the opinions and insights of millions of consumers annually, published the results of the "2011 Initial Quality Study" in which Lexus topped the list, but Honda swept on seven segments. According to the study, the initial quality of new models declined significantly compared with the new vehicles released between 2007 and 2010. Although, the overall quality, improved from 109 problems per 100 vehicles in 2010 to 107 problems per 100 vehicles in 2011. On the other hand, models that didn't have redesigns on their lines, reported 103 problems against the 108 of 2010. The lowest number of problems per 100 cars, suggest a lower rate of incidents and, therefore, better initial quality. The fact is that latest technologies have become crucial to gain consumers, but manufacturers shouldn't lose focus on reliability, which is still the most important reason why a new car buyer chooses a model over another. The list of the new vehicles with best initial quality covers cars of all prices and segments, so at Autopten, we emphasize only in the most economical and cheapest ones shown below. Honda Fit 2011, which had the highest rate in the 'subcompact cars' segment. Honda Civic 2011, which had the highest rate in the 'compact cars' segment. Mazda Mx-5 Miata, which had the highest rate in the 'sport cars' segment. The decline in quality is evident in areas such as engine, transmission, audio, entertainment, and navigation system, because of the creation of software to make more efficient cars, but it can be a problem as it casts doubt on the engine and transmission at the time of accelerate and change the speed. Although the introduction of multimedia technology, speaker phones, and voice-activated systems attracts many consumers, for some people this is a problem as functions are not intuitive or not always work properly. Obviously, consumers are interested in having new technologies in their cars, but manufacturers must ensure that they are ready and working properly. Video — Honda Fit is the cheapest car with the best ratings on initial quality in the subcompact cars segment, according to J.D. Power.